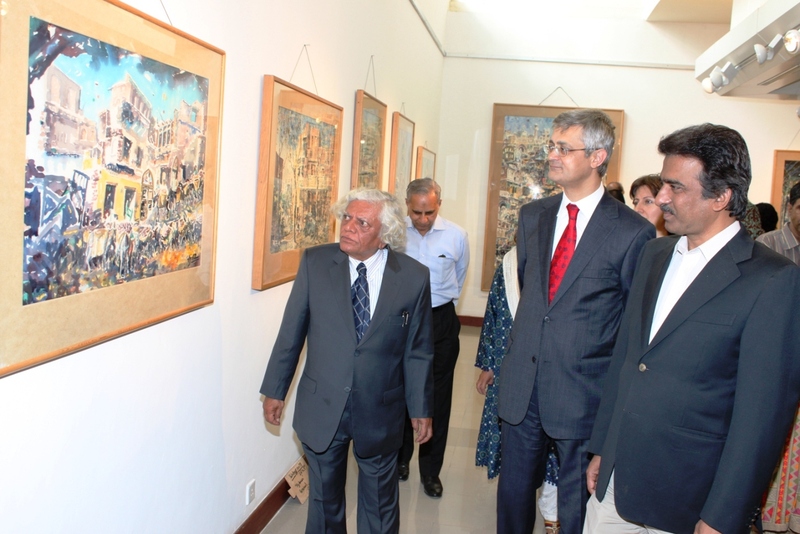 The veteran artist Dr. Ajaz Anwar explains the theme behind his paintings to the Turkish Ambassador Mustafa Babur Hazlan and DG of PNCA Tauqir Nasir. The water-colour paintings by Dr. Ajaz Anwar, put on display at National Art Gallery on Tuesday, were more than mere art. 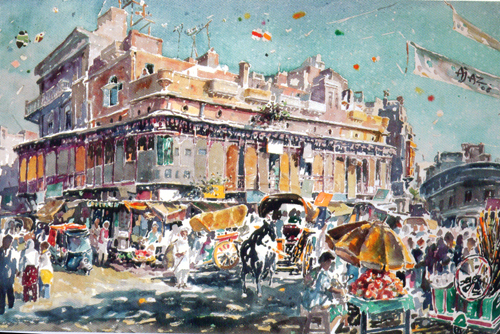 Dr. Anwar, by employing water-colours, has revived the grandeur of past cultural life of Lahore city – also known as the cultural centre of Pakistan. The exhibition of paintings is a huge one, comprising of about 230 paintings by Dr. Ajaz Anwar, the veteran artist and also some 55 cartoon sketches by Anwar Ali, the pioneer in cartoon journalism in Pakistan. The fine exhibition was inaugurated by H.E. Mustafa Babur Hazlan, the Ambassador of Turkey. “The artist has beautifully created vivid memory of Lahore using water-colours, a medium which is more difficult than others” said the Turkish Ambassador while appreciating the work of the artist and his flair for the Turkish language. “Dr. Anwar is more than an artist, he is a historian, who has brilliantly documented the culture, art and traditions of Lahore city” remarked Mr. Hazlan. The red and yellow-coloured buildings, a clear blue sky dotted with multi-coloured kites and the young, children on rooftops, was a common sight in his paintings. The celebration of the kite flying festival called Basant, reminded of a cheerful past of the city when the eve of spring was celebrated with full fervour. The depiction of the legendary architecture of Lahore, in the paintings of Ajaz, is a brilliant reminder of the diminishing city culture as most of the old buildings of Lahore have now disappeared or their fascias have been badly damaged. The characters in the paintings such as a Tonga rider, women walking in the bazaar, children playing, milkman, old people talking, and sellers of all kinds represent the daily life in Lahore. Speakers also noted that the artist has preserved the history of cultural city of Lahore through his work which would help to promote the socio cultural traditions and folk heritage of Pakistan. While the cartoon sketches reflect the political and social issues in the society of 60s and 70s but are still relevant in modern age. The exhibition that would continue till May 18 would be followed by a water colour workshop conducted by Dr. Ajaz Anwar from 17th- 19th April while a reading session titled “Extracts from Dr. Ajaz Anwar’s memoirs” will be held on May 10.